In divorce cases, both parties may be required to submit a financial disclosure statement. 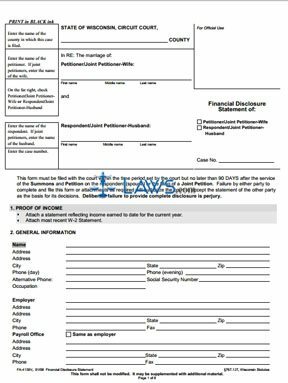 This form FA-4139 can be completed by either party in a contested divorce, or either party in a joint petition for an uncontested divorce. The document is available on the website of the Wisconsin Court System. Wisconsin Financial Disclosure Statement FA-4139 Step 1: At the top of the first page, indicate which party is filing this form. Enter both spouses' names, the case number you have been assigned, and the county in which you are appearing. You must attach your most recent W-2 tax statement and a statement detailing your income for the current year, such as a bank statement. Wisconsin Financial Disclosure Statement FA-4139 Step 2: Section two requests general information about you and your employer. Wisconsin Financial Disclosure Statement FA-4139 Step 3: In section three, enter the names of all members of your household, as well as their relationship to you. Wisconsin Financial Disclosure Statement FA-4139 Step 4: Detail your monthly income and deductions withheld from wages in section four to calculate your monthly net income. Wisconsin Financial Disclosure Statement FA-4139 Step 5: In section five, detail your monthly expenses. Wisconsin Financial Disclosure Statement FA-4139 Step 6: In section six, detail all assets you and your spouse possess, whether singly or jointly. Wisconsin Financial Disclosure Statement FA-4139 Step 7: In section seven, list all forms of insurance you have. Wisconsin Financial Disclosure Statement FA-4139 Step 8: In section eight, list all debts, including the current balance owed and the size of your monthly payments. Wisconsin Financial Disclosure Statement FA-4139 Step 9: In section nine, detail any assets sold, given away or destroyed in the past year. Wisconsin Financial Disclosure Statement FA-4139 Step 10: In section ten, note and explain any litigation you are currently involved in. Wisconsin Financial Disclosure Statement FA-4139 Step 11: In section eleven, detail any cases in which you have filed for bankruptcy, including the date on which you filed and the current status of your petition. Wisconsin Financial Disclosure Statement FA-4139 Step 12: Sign and print your name on the last page, along with the date. You do not need a notary public for this document.